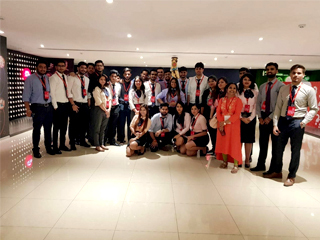 JIMS organised an industrial fair to Coca Cola Happiness factory at, G. Noida on 7th September 2018 for PGDM Batch (2018-20) section B students. Students were divided into 2 groups so as to have a glimpse of the entire factory. They were made to register on a portal after which they were allowed to have their favourite COCA COLA beverage from the refrigerator. Each one of them enjoyed this as they could taste the soft drinks in the factory it was prepared in. Students were explained about different products Coca Cola Pvt. Ltd. has been manufacturing in India including Kinley, Coca Cola, Fanta, Sprite, Coca Cola Zero, Minute Maid Pulpy Orange, Mazaa, Diet Coke, Limca and Thums Up amongst others. All these brands were displayed on a wall with a small gist about their respective brands. Next stop was the audiovisual room which gave the insights related to the company viz. its origin,number of facts related to its production, manufacturing and consumption.Throughout the tour students were accompanied by the company representatives who were kind enough to explain everything in detail and with generosity. As the AV room session ended students all were given a chance to enter into THE VAULT which is a replica of the original vault where the secret recipe of Coca Cola is preserved. However being a secret students were just given overview about the mechanical and chemical process behind the manufacturing of different soft drinks and the bottles they are delivered in. It was the most informative session of the entire tour. Students were acquainted with some new concepts of CIP (cleaning-in-place) process,water replenishment process, hotline, preform to mould bottles, check (volume of drink in bottle) process, homogenising, etc. This was followed by a brief talk on the bottles manufactured by the company since its inception. Students were told about a strategy that the company used to avoid infringement -changing the mould for bottles rapidly in its initial years so that the duplicators could not copy them. At present the company has already patented the contour bottle. The patent was granted in the year 1915. Moreover the company now offers its customers to design customised bottles for themselves in around 40 countries of the world. All these bottles were kept as display in the Happiness factory for the visitors to glance at. Not only the company worked for generating revenues but also for the society and its welfare. The company devotes at least 5% of its net profit to CSR activities. These included the Limca Book of World Records, Project VEER in association with Salman Khan’s Being Human which works with the disabled people, Parivartan - for vocational skill development, Support My School and most importantly the water replenishment program. Coco Cola was the first company to have changed the image of children’s favourite Santa Claus.In a seperate section, Santa Claus as the initial ambassador of Coca Cola was depictedusing the posters painted in its initial years. A Q&A session was also held wherein all the students asked whatever queries they had related to the brand, products, and the processes it follows to manufacture them. The resource person present there was readily giving all the answers and asked students to get their photographs clicked at the end of the session. Established by John S. Pemberton in 1886 at Atlanta, US. Formula patented in 1887 and trademarked in 1893. The company came to India in 1973 but returned to US only to come back in the year 1993 after liberalisation. · The recipe for the beverage is known to only 5 people in the world. 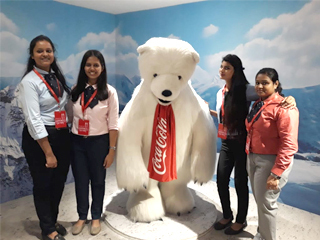 The overall trip was an informative one giving all the students in sights about Coca Cola as a brand and a world renowned beverage producer.